Why aren’t you eating more nuts? It doesn’t seem very long ago that nuts were getting a bad rap for their high fat and calorie content. A lot of people avoided them, especially those who wanted to lose weight. Not only do nuts NOT lead to weight gain, they may help you lose weight. Plus, they come with so many health benefits that they are actually a very important food group. Tree nuts, in particular, are a great source of protein of protein and healthy fats. They’re loaded with vitamins, minerals, antioxidants and other compounds that fuel your body and protect against disease. Still less than 40% of Americans eat nuts on a regular basis. Instead, you should be eating them every day. Now, I don’t have a favorite tree nut. I like all of them. Most of the time I choose mixed nuts. But other times, I’ll just grab a bag of one type of nut or another. Here are some of my top picks. Walnuts. One of the things I like about walnuts is the positive effect they have on your gut microbiota. Just 42 grams (slightly more than an ounce) of walnuts daily can increase the abundance of gut bacteria that have anti-inflammatory and probiotic activities. They also enhance bacterial populations that produce a short-chain fatty acid (SCFA) called butyrate. This SCFA helps increase blood flow in your colon and also appears to reduce the risk of colon cancer by blunting the spread of cancer cells and stimulating their death. What’s more, butyrate reduces pH levels, harmful metabolites and enzyme activities that are harmful to the healthy microbiota in your gut. There is even evidence that it can reduce IBS symptoms. Almonds are another nut that can have a positive influence on the composition of your gut microbiota. In particular, the natural skin that appears on almonds has prebiotic activities that fuel the beneficial bacteria in your gut. But that’s not all a handful of almonds will do for you. Additionally they decrease several inflammatory markers, such as IL-6 and CRP, which are associated with type 2 diabetes and heart disease. Just 56 grams (almost two ouncers) daily for four weeks can slash these markers by more than 10%. Brazil nuts are also able to help reduce inflammatory markers. Plus, they may give a boost to your brain function. 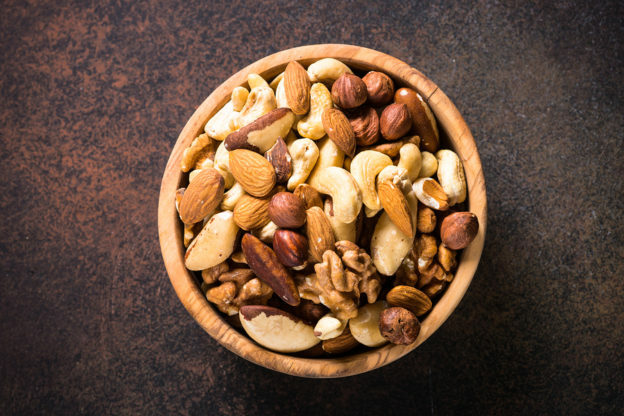 It turns out that eating these nuts (possibly due to their high selenium content) can improve cognitive performance in adults with mild cognitive impairment. And here’s something else about Brazil nuts. When people ate a total of four Brazil nuts, it improved their LDL/HDL ratio for a total of 30 days. That’s right – just four nuts lowered LDL and increased HDL for a full month. Pistachios are another good choice. Along with helping to enhance the composition of your gut bacteria, they also improve blood pressure and endothelial function, decrease fasting blood sugar and enhance insulin metabolism. Pecans. While all nuts have a positive effect on your cardiovascular system and LDL particle size, one thing I like about pecans is that they have been shown to decrease levels of apolipoprotein B (apoB) by about 11%. This is an atherogenic substance that attaches itself to the surface of small, dense LDL particles. These particles slip easily into your arterial walls, and apoB is the substance that promotes the plaque build-up associated with them. You can easily see why it’s so hard to choose one nut over another! However, there is one nut you should never eat. All in all, tree nuts can have a profound effect on your gut microbiota, endothelial function, blood pressure, and inflammation markers. These are four important factors in maintaining a healthy cardiovascular system and protecting against heart disease. They also protect against the development of type 2 diabetes. And recent data shows that eating more nuts may help ward off numerous types of cancer. However, there’s one nut you should avoid at all costs. Believe it or not, this food isn’t even a nut. It’s a legume. And these crunchy treats are one of the top allergens in the world today. Peanuts also contain proteins that are resistant to digestion and are considered toxic. Even worse, peanuts contain aflatoxin, a natural toxin produced by certain strains of mold. Aflatoxin is a carcinogen that’s been shown to cause cancer in rats. Instead, choose Brazil nuts, walnuts, pecans, pistachios and other tree nuts. Buy organic, unsalted brands… and enjoy a life that’s all the healthier for it. Holscher HD, et al. Walnut Consumption Alters the Gastrointestinal Microbiota, Microbially Derived Secondary Bile Acids, and Health Markers in Healthy Adults: A Randomized Controlled Trial, The Journal of Nutrition. 2018. Published online first. Zaleski A, et al. Butyric acid in irritable bowel syndrome. Prz Gastroenterol. 2013; 8(6): 350–353. Liu Z, et al. Prebiotic effects of almonds and almond skins on intestinal microbiota in healthy adult humans. Anaerobe. 2014 Apr;26:1-6. Liu JF, et al. The effect of almonds on inflammation and oxidative stress in Chinese patients with type 2 diabetes mellitus: a randomized crossover controlled feeding trial. Eur J Nutr. 2013 Apr;52(3):927-35. Colpo E, et al. Brazilian nut consumption by healthy volunteers improves inflammatory parameters. Nutrition. 2014 Apr;30(4):459-65. Rita Cardoso B, et al. Effects of Brazil nut consumption on selenium status and cognitive performance in older adults with mild cognitive impairment: a randomized controlled pilot trial. Eur J Nutr. 2016 Feb;55(1):107-16. Colpo E, et al. A single consumption of high amounts of the Brazil nuts improves lipid profile of healthy volunteers. J Nutr Metab. 2013;2013:653185. Hernández-Alonso P, et al. Pistachios for Health. What Do We Know About This Multifaceted Nut? Nutr Today. 2016 May; 51(3): 133–138. Are You Being Tricked Into Overeating? This entry was posted in General Health and tagged do nuts protect your heart, health benefits of nuts, is eating peanuts safe, is it ok for diabetics to eat nuts, is it okay to eat nuts, nuts and gut microbiota, which nuts are healthiest, will nuts make me fat, will nuts make me gain weight on May 30, 2018 by Taylor Donnini.